Police shot and killed a man who threatened them with a large knife near Times Square Saturday afternoon. Officials said the man, who police observed smoking marijuana on 44th Street and Seventh Avenue, became agitated when officers approached him. He then pulled out an 11-inch knife and raised it over his head. Officers ordered him to drop the weapon, but he refused, police said. As the man backed down Seventh Avenue, police pepper-sprayed him six times to try and disarm him, but the man continued to threaten officers with the knife, officials said. Police said that as he neared the corner of 37th Street, he lunged at officers with the knife, forcing them to shoot him. Two officers fired a total of 12 shots, striking the man in the chest, groin, left arm and left calf. The man was identified Sunday by police as 51-year-old Darrius Kennedy of Hempstead, Long Island. Police say Kennedy has 10 prior arrests, one of which resulted in him being hospitalized for a psych evaluation in October of 2008, after police took him into custody for knocking garbage cans over in Times Square. In November of 2008 Kennedy was arrested for threatening motorists and cops with a screwdriver on Broadway and West 66 street, police said. No officers or bystanders were injured in Saturday's incident, which took place in an area crowded with pedestrians. Witnesses to the shooting described a chaotic scene in Midtown. "I was standing at the corner of 42nd Street and saw this guy running in middle of street, police chasing him" said Edgar Delgado, who works in the area. "He had a machete type knife. He didn't want to stop. Police told him to drop the knife. He didn't. They shot him." 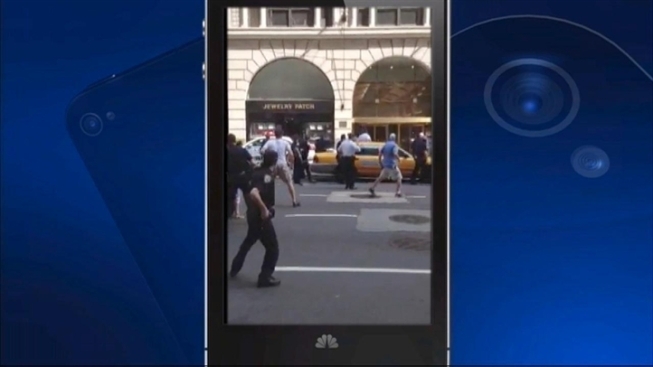 A witness' cell phone video acquired by NBC 4 New York shows police pursuing the Kennedy along 7th Avenue and then opening fire. "It was scary because a shooting starts here someone could get hurt quickly," Delgado said.